Photo: Children who benefit from our team’s weekly outreach on the island of Cebu are excited about the upcoming launch of our new Children’s Hope Center education program. 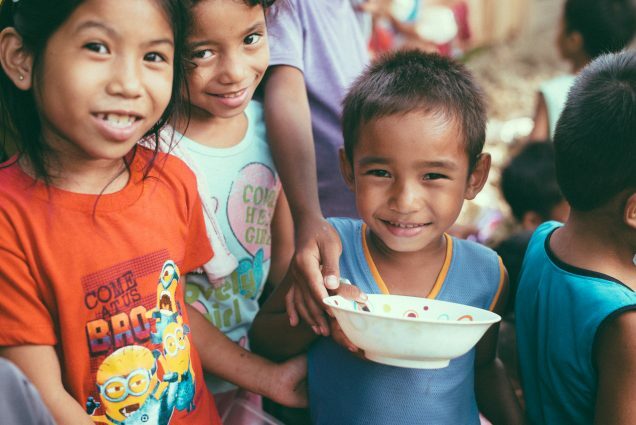 In some good news coming from our native team in the Philippines, we are in the final phase of starting a Children’s Hope Center program on the island of Cebu, which is slated to open in early March to 30 children. The Children’s Hope Center model was first established in 2011 by our India team, comprised of after-school care programs such as tutoring and computer education, along with snack and meal services for children suffering from extreme poverty. The program model has proven highly effective; this will be our 5th Children’s Hope Center launch. We do not have a designated building for the Cebu Hope Center at this time, so the program will be held in an multipurpose facility on our main campus. Our native team will bring the children to the shelter after their classes at school and give them a nutritious hot meal, assist them in completing their homework, nurture and guide them on how to live in a suitable manner that blesses their local community and teach them to value their neighbors, boost their self-confidence, and provide them with all the necessary supplies that their schools require. In other good news, we are in the process of expanding our piggery to house 4 more pigs which brings the total to 10 pigs, and we are also building stronger pig pens made of concrete. Our current pig pens are made of bars and galvanized iron pipes which are easy to destroy and last only 1-2 years, whereas the concrete pig pens are much more durable and will last 5-8 years. We are seeking to raise $2,041 for the materials and labor required to build the concrete pig pens, and we hope to begin construction during the first week of March. We are thankful for your support and for generous contributions from our donors which will make the improved piggery possible. The micro-venture will be a valuable source of income for us since each healthy, mature pig sells for $175 at market. The good yield is attributable to strong demand in the market as pork is a local staple. Photo inset: (Top-left): Children on the island of Cebu receive hygiene supplies from our native team’s weekly outreach program. 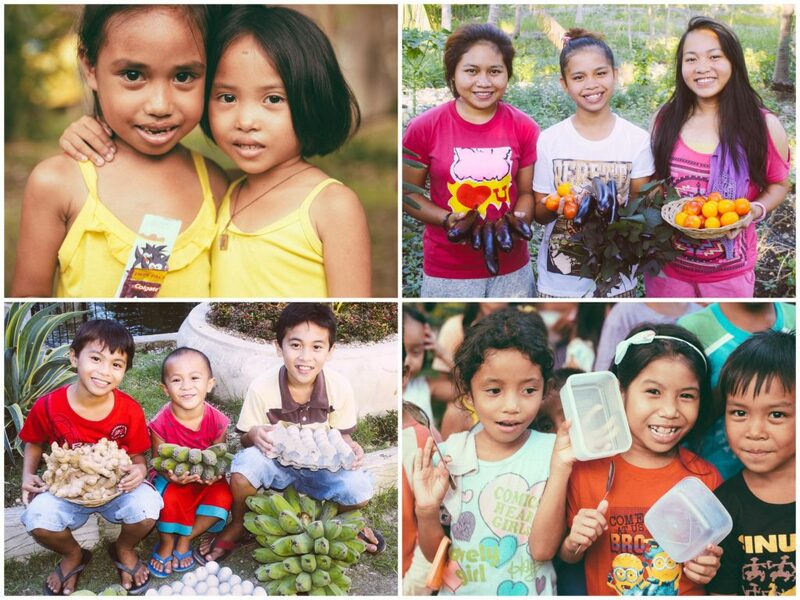 (Top-right): Girls from our Philippines orphan home are thankful for an abundant harvest from our team’s garden. (Bottom-left): The food from our native team’s farmland provides nutritious meals for our children, as well as increasing profits for our programs. (Bottom-right): Our Cebu Hope Center will provide much needed meals and after-school support to local children in need. We recently had a good harvest in our garden: we harvested 11 pounds of eggplant, 6 pounds of tomatoes, 6 pounds of sweet potato tops, and 6 pounds of spinach, providing nutritious, organic ingredients for the children’s meals. In addition, sweet potato tops are a good source of protein, minerals, and dietary fiber, and nutrients such as calcium, magnesium, sodium, phosphorous, sulfur, iron, and zinc — these leaves can be brewed as a tea, or enjoyed in a salad. We are also planning to expand our garden and grow more vegetables such as bitter melon and okra which we plan to harvest in 4-5 months. In order to expand the garden and plant these 2 new vegetables, we need to cultivate the soil and build a surrounding fence to protect our crops from animals and wild beasts. We are thankful that our banana grove has recovered from past damage, and that we were able to plant new, native fruits on this plot of land — we planted pandanus fruit, bignay berries, and tumbaga fruit. In pursuit of our sustainability goals, our team has also maintained a hen house project which currently contains 140 hens that produce around 123 eggs per week. We expect production to increase as this new batch of young hens matures. We recently improved our hen house project by installing a double net to cover the entire building to prevent small animals or birds from entering the hen house and eating our eggs. Our entire farmland enterprise is working well along with our two fishery ponds. The main concrete-lined pond holds a volume of approximately 20,000 gallons (75,000 liters) of fresh water pumped from our on-campus well. All of these efforts not only aid in providing nutritious ingredients for our children’s meals, they also help diversify and increase profits, empowering our local team to reach even more children.